First, I want to apologize for the pretty large gaps in postings here. My intention had been to post something weekly and to be steadfast in reminding you about your belonging. This has been my first attempt at blogging in my life, and I am learning a thing or two. Gaps in connection can be hard. For survivors of interpersonal trauma, gaps in connection can sometimes feel devastating and even life threatening. Early caregivers may have alternated between periods of providing love and safety to periods of sudden, unpredictable anger, silent treatments, or physically disappearing. So, gaps in connection in adulthood sometimes bring up the same feelings of terror, betrayal, abandonment, and aloneness in the world that were so devastating in childhood. Have you ever had the experience of believing that someone really cares about you when you are in the room with them, and then during the gaps between visits you truly feel that you are completely Alone with a capital A? This is a very common experience for survivors of complex trauma, and a good reason to exercise your belonging muscle even, and maybe especially, in the gaps! The thread of belonging is always there. When the people in your life are inconsistent, unpredictable, not healthy for you, or even just busy, you still belong in the world. Really knowing your belonging in the world will help you to ultimately walk toward healthier and healthier relationships and away from ones that are more harmful. I love this poem by William Stafford to help remember the thread of belonging that is always there even when we can't feel it. Thanks to someone in my neighborhood who made these colorful copies and put them in a little box outside their house for people to take. Paint or color your thread of belonging in the world. Use colors and shades of light and dark to portray not only your thread of belonging, but also all the things that may be obscuring it or making it hard to see or feel. As you are going about your day, tune into the colors, shapes, and textures of your thread. Use the pink thread in the image above as inspiration if you'd like. Don't worry if your thread is invisible for now. I promise, it is there. Don't give up on it. When I was a graduate student there was an atmosphere of frenetic anxiety among my cohort when it came time to apply for pre-doctoral internship. The problem was that there were nowhere near enough internship slots for all of the students applying across the country and so there was a risk of not getting an internship and therefore not being able to graduate anytime soon. I took a trip to the coast to escape the frenzy. As I was walking along the little row of shops there I was intrigued by a sign that read "sacred stone readings." I entered and met a woman named Violet who had a big velvet bag of stones. She asked me to focus on a question and select a few. I did so and she then asked me what my question was. I said, "Will I get a good internship?" Upon hearing this question, Violet put down the coffee mug she was holding, leaned forward, and looked me in the eyes with great intensity. She said, "Do you know what your problem is? Your problem is that you know what you know, but you don't know that you know what you know." I don't think her statement had anything to do with the stones in the velvet bag, but it had a far greater impact on me that the rest of the reading. With her proclamation, she set me on a path of wondering about my untapped wisdom and what resources I might have that I don't even know I have. In times when I'm all caught up in self-criticism, Violet will interrupt me with her kind and dead-serious eyes asking, "Do you know what your problem is?" Complex trauma can put us into biological and emotional states that narrow our senses and make it difficult to wake up to the reality of our own wisdom. If we can practice living according to Violet's proclamation, the world of possibility can suddenly expand and life can, maybe, be a whole lot more fun. -The next time you are caught up in worry, fear, anxiety, or panic, imagine a wise friend or mentor arrives out of the blue just when you need them. Imagine that they ask you to focus on your question. Tell them your question. Imagine that they put down their coffee mug, lean toward you, look you squarely and warmly in the eyes and say, "Do you know what your problem is? Your problem is that you know what you know, but you don't know that you know what you know?" Maybe even ask someone to you trust to say these words to you. Really take it in. Notice what happens. Non-human animals have a lot to teach us about belonging. I recall a story of a dog being accidentally locked outside overnight in the dead of winter. The dog spent the night hungry and shivering. The next morning, the dog's human opened the front door only to be surprised by her pet jumping up on her and licking her face, happy to see her. As the story went, the next night, the human accidentally locks her partner out of the house. When she opens the door the next morning, her partner is not so happy to see her. Unlike the dog, it also takes her partner over a year to trust her again. When it comes to healing from trauma, out animal friends can be great allies. When receiving a warm glance or a compliment from a friend feels scary or unpleasant, we might not be able to receive it or the sense of belonging that could have come with it. However, if we imagine a protective mama bear between us and the friend, we might be able to better receive the warmth because of the sense of protection that bear can provide. When we feel bogged down in shame, imagining the playfulness and lightness of the otter or the fox might provide a little respite. When we are dissociated and disconnected from our bodies, the groundedness or the turtle or the weightiness of the whale might be good allies. 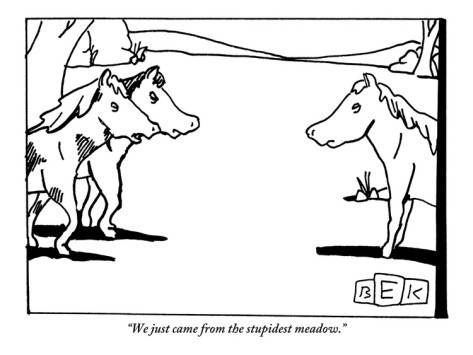 Here's a silly reminder from the New Yorker that animals don't judge in quite the same way that humans do! -Without thinking about it too hard, what animal would it feel really good to encounter right now? List some of the qualities of this animal. Imagine yourself embodying those qualities. Stand like that animal stands, walk like that animal walks. What do you notice? Imagine your animal ally with you for the rest of the day and if you'd like to, jot down some notes at bedtime about what you noticed. - Find a song that gives you a sense of belonging and play it for yourself. Really take in the sound, the lyrics (if there are any), the way it makes you feel. Put your complete attention into the song. - Make yourself a whole belonging playlist! It doesn't matter what the songs are or whether they would give someone else a feeling of belonging. Find songs that resonate with you! Sometimes things just hurt. Sometimes we can get stuck inside of our own individual hurts like a hamster inside of a wheel, trying ferociously to outrun or outsmart the pain. But sometimes things just hurt. If we can open our hearts to our own grief, we can open our hearts to the grief of the world and we can open our hearts to a depth of love we never knew to be possible. This doesn't and probably shouldn't happen all at once. Rather, we open our hearts to a chunk of grief, and then rest while our heart recovers and stretches to accommodate its new occupant. And, in fits and starts, we move forward with bigger hearts, a little more open to our own radiance and the radiance of the world. - If it feels right for you, check in with your heart. While you are paying attention to your heart, hold your right hand in a fist. Notice whether your heart feels tight like your fist, or relaxed and open. If your heart feels tight, slowly and gently open your palm, simultaneously opening your heart. Place your open palm on your heart and remember that you belong. We all need mentors. The good news is that mentors are everywhere. Maya Angelou has been one of the people I would consider such a mentor. I have never met her, but her words hit home and cut through to a sense of goodness and belonging that we all need. In her book, "Letter to My Daughter," she writes, :"I gave birth to one child, a son, but I have thousands of daughters. You are Black and White, Jewish and Muslim, Asian, Spanish-speaking, Native American and Aleut. You are fat and thin and pretty and plain, gay and straight, educated and unlettered, and I am speaking to you all. Here is my offering to you." You can check out Maya Angelou's book, "Letter to My Daughter," by clicking "Look Inside," after following the Amazon link. You can read the entire short first chapter entitled "Home," within the preview. By the way, you don't need to a daughter or identify as female to benefit from the reading! Here is Dr. Angelou with Oprah on "the best advice she's ever given." May Dr. Angelou's mentorship move you a smidge further toward knowing your own belonging. - If there is someone you would consider to be a mentor in your life, write about their attributes that make them a good mentor. For example, I would describe Maya Angelou as unconditionally loving, steadfast, warm, wise, and strong. Alternatively, you could write about the attributes you would give to your ideal mentor if you could create a mentor to be whomever you wanted them to be. Get as specific as possible, and imagine them in as much detail as you can. Then practice closing your eyes, and in your mind asking your mentor for advice with a specific situation. - Pay attention this week to any unacknowledged mentors that might be in your life right now! It may come in the form of something a stranger says to you, an article you come across, or your own inner voice. Pay attention and allow yourself to be surprised! Why do we long to belong? In her recent talk on trust, Tara Brach, clinical psychologist and founder of the Insight Meditation Society of Washington DC says, "The reason that we long to belong is because the truth is that we do belong." Coming home to a sense of belonging is coming home to the truth of who we really are. She also comments on the fact that research shows that when we imagine ourselves in a situation of belonging, our brain responds the exact same way as it does when we are actually in a situation in which we feel a sense of belonging. So by spending time each day devoting a little attention to belonging, you are changing your brain to be more aligned with the truth of who you are. I recommend this entire 2-part talk on trust and belonging. In part 1, there is a wonderful little "belonging scan" beginning about two minutes into the talk. - Practice the belonging scan every day this week. 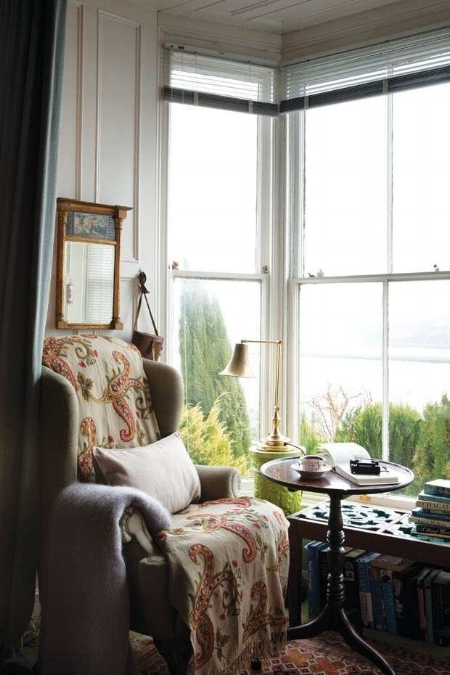 - Imagine your ideal place of belonging in as much detail as possible. Use writing, drawing, painting, collage, or whatever means of expression speaks to you in order to connect with this place. One of the most difficult effects of complex trauma is the sense that there are no safe places to come home to. Even places that in actuality are safe, often just don't feel safe. This bite-sized poem helps to set an intention to create a safe haven within oneself. Even if it doesn't resonate at first, or even for a long while, it is worth repeating these words to yourself. At first it may feel strange, or pointless, or it may even bring up difficult emotions like shame or loneliness. I urge you to keep offering yourself the wishes written in the poem. Be steadfast in your intention to love yourself and watch the world transform. I encourage you to read those two words - to re-read them. What happens in your mind? What happens in your body? What emotions do you feel? What memories come up for you? Ideally, reading or hearing the words "you belong," would feel good. It would lead to sense of peace and relaxation in the body that comes from remembering that we are safe because we are not alone. However, those words often don't land that way. In working with survivors of interpersonal trauma (trauma that has been perpetrated by someone depended on for survival or for emotional needs), the issue of belonging is huge. Because belonging brings up thoughts and feelings about other people, the first reaction is often not peace and contentment, but fear, loneliness, or shame. My goal in creating this blog is to be steadfast in reminding you of your belonging. I will do so with the assistance of poets, trees, animals, maybe even some psychology research, and other yet-to-be-discovered sources of information. I will also suggest a belonging practice along with each post. Here is the poem that first caught my attention about my own belonging. I was heartbroken about a loss at the time, and going for a long walk in the pouring rain along the Charles River in Boston. It was national poetry month and there were little placards placed along the esplanade, each displaying a different poem. 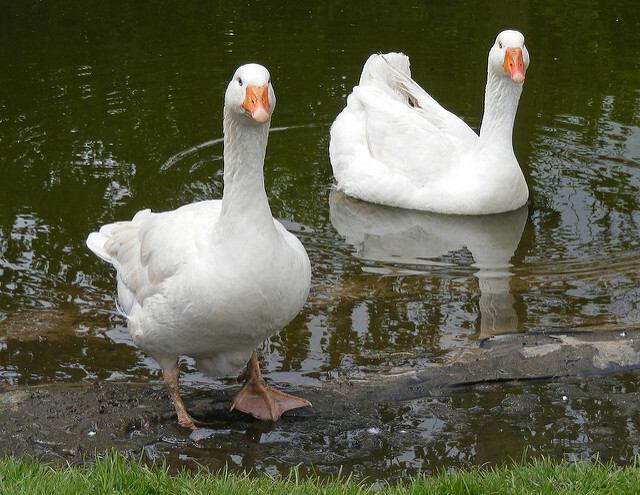 As I read Wild Geese, two wet geese walked by. 1. Journal about what happens when you read the words "You belong." What happens in your mind? What happens in your body? What emotions do you feel? What memories come up for you? 2. Pay attention to the "wild geese" in your life this week. That is, keep your senses open for an unexpected belonging reminder.